When the Washington Redskins drafted Trent Murphy in 2014, they were expecting elite pass rushing abilities. Despite that, the outside linebacker only managed a combined six sacks in his first two seasons. With the addition of rookie Preston Smith (eight sacks) last season, it looked like Murphy’s opportunities were starting to run out. Then came the brilliant idea to move him to the defensive line. At 6-5, 290 pounds, Murphy had the size of a defensive end. Meanwhile, his speed and strength made him the perfect candidate to help a defensive line that struggled at getting to the quarterback in 2016. However, injuries struck the Redskins once again. For the second straight year, outside linebacker Junior Galette suffered a torn achilles, ending his season. With Galette down, Murphy had to reclaim his role as an outside linebacker to give the Redskins depth. This switch didn’t last for long, however. The Redskins soon started having problems with injuries and under-performance on the defensive line. It was obvious that Murphy’s biggest impact would come from playing there. Through the first five weeks of the season, Murphy leads the Redskins with 4.5 sacks. He’s also managed team-highs in tackles for loss (4), and forced fumbles (2). What those numbers show is that Murphy’s not just doing well against the pass. His big strength has always been in the running game. However, the addition of some weight and some much better swim moves on the defensive line have given Murphy a much more rounded game. There’s still plenty of season left, so it will be interesting to see what the 25-year-old can do. He’s clearly working to continuously get better, and the Redskins are going to need him if they expect to succeed. The weak point of the Redskins in 2016 has clearly been the defense. Although they’ve played better as of late, they still aren’t exactly something you’d write home about. However, it would go a long way if Murphy can give them another threat on the line to compliment Chris Baker. With those two on the defensive line, there will be less pressure on the linebackers to perform. 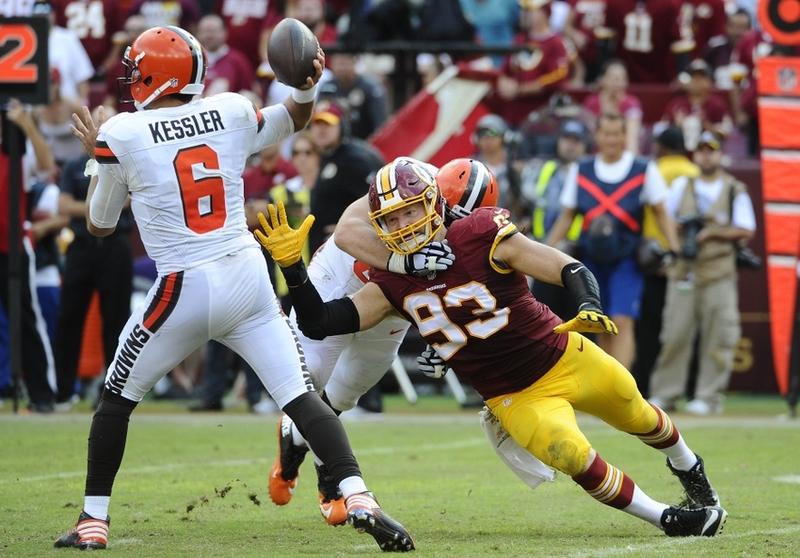 With Mason Foster and Will Compton need less in the “plugging up holes” game, it will free them to roam more. More roaming leads to better coverage, and less 15-plus yard runs. Will all of this work out as planned? That’s to be seen. One thing is certain however, Murphy’s going to be right in the middle of everything, and it’s all thanks to his move to the defensive line.